Cahnman's Musings: Four Texas Congressmen REFUSE TO PARTICIPATE in Harvey Hostage Taking!!! Four Texas Congressmen REFUSE TO PARTICIPATE in Harvey Hostage Taking!!! Signs of life in our congressional delegation?!? The U.S. House approved $15 billion in aid to support those affected by Hurricane Harvey's destruction in southeast Texas on Friday, sending the legislation to President Donald Trump's desk for his signature. Later in the day, Trump signed it into law. 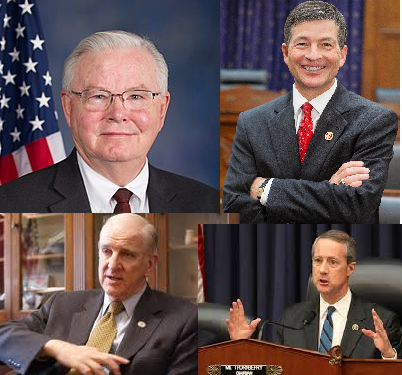 Four Texas Republicans voted against the bill: U.S. Reps. Joe Barton of Ennis, Jeb Hensarling of Dallas, Sam Johnson of Richardson and Mac Thornberry of Clarendon. Obviously, what happened this past week in D.C was disgraceful. And, unfortunately, it's probably something we're just going to have to deal with in the coming months. But it's good to see four members of the Texas delegation (none of whom are typically known as profiles in courage) reject this act of political blackmail. Bottom Line: Good for them.